Born: August 16, 1816 in Wareham Ma. 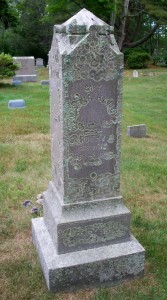 Died: October 31, 1884 in Bourne Ma. at 69 yrs. Married: December 31, 1839 in Wareham Ma. 1. Henry Thomas Handy; (July 7, 1845 – August 27, 1916); Married Lilla Perkins Ellis (1851 – 1930) (Anson Burgess Ellis & Harriet Newell (Howes)) in Sandwich Ma. on November 28, 1872; They had 9 children; Henry & Lilla are buried in Cataumet Cemetery. 2. Joshua Lewis Handy; (July 31, 1853 – October 30, 1884); Married Annie DeWitt Bourne (1853 – 1932) (Benjamin Franklin Bourne & Elizabeth Wheaton Lincoln) in Sandwich Ma. on November 6, 1878; Annie married (2) Edwin Phillips, Capt. (1840 – 1891) (Stephen Phillips & Lurana Chase) in Bourne Ma. on March 6, 1890; Edwin married (1) Josephine Taylor (1844 – 1898) (Ezra Taylor & Abigail Baker) in Harwich Ma. on February 18, 1859; Joshua, Annie & Edwin are buried in Cataumet Cemetery.